The subtitle of this book is: Problems faced in the writing of history. It is just as helpful to consider the information in this book when reading history so that you can have a more discerning eye. Trueman is one of my favorite commentators on historical issues ranging from the Reformation to contemporary evangelicalism. He has a subtle and intelligent mind. Plus, his English sense of humor never gets boring. Trueman offers a lot of wisdom for those interested in serious study of history. He walks you through several major issues and helps you to see the pitfalls to avoid. 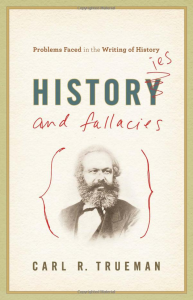 Some of the central ideas he lays out are: there is a difference between historical neutrality and historical objectivity, which helps in the postmodern discussion; good historians will always submit that their claims are hypothetical and subject to modification pending further evidence; and, avoiding historical anachronisms can be aided greatly by a thorough understanding of the historical context. Trueman also gives a chapter to various historical fallacies. Whenever I read a book like this I am always a little apprehensive about conclusions I have previously made about history. I want to avoid the errors that authors like Trueman make devastatingly clear. Trueman’s work is surely meant to put a little caution and apprehension into the reader. Of course, here is much more to the book than just the warning. There is invaluable historiographical wisdom for those who want it. And, Trueman’s forays into Holocaust denial, Marxism, Calvin-Turretin comparisons, and considering whether Luther was a racist adds significant value to the book and even more reasons to take up and read.